2015 Road Trip Photos #13: Up the Mountain to the God of Fire « Midlife Crisis Crossover! 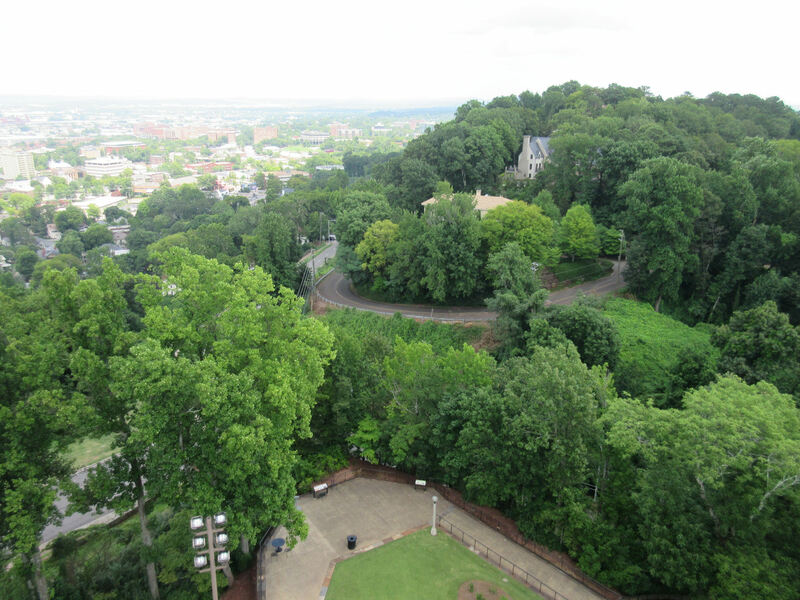 The southbound road from downtown Birmingham led us up a ridge called Red Mountain, so named for its red iron deposits and the suitably colored surfaces. 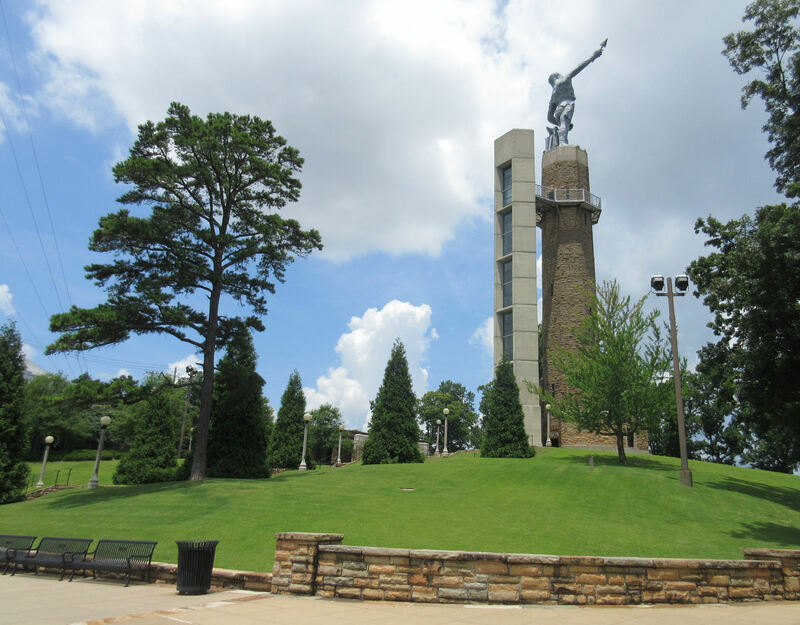 Atop one particular crest there’s a park centered around what’s billed as the world’s largest cast-iron statue, molded in the likeness of Mount Olympus’ most underrated resident, the Roman god Vulcan. 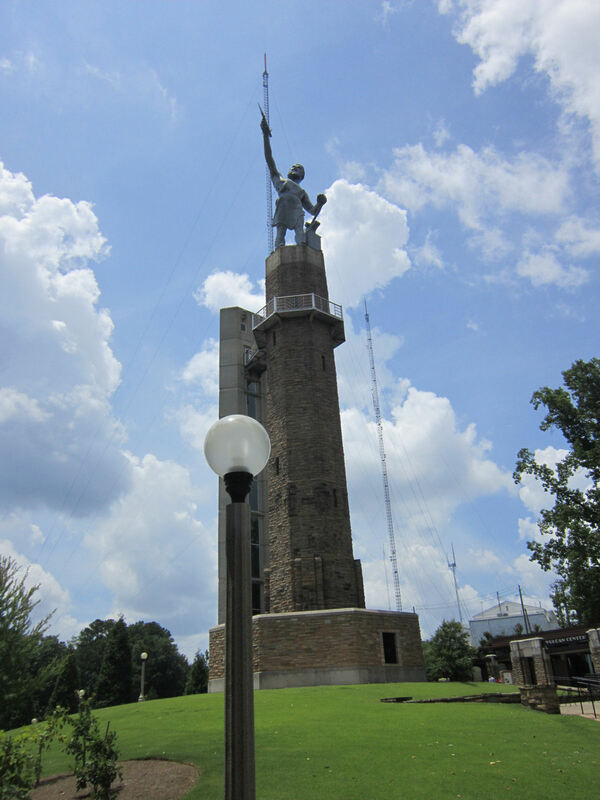 This version of Vulcan began life as a commissioned piece on behalf of Birmingham for the 1904 World’s Fair in St. Louis. After the fair, he stood proudly at the Alabama State Fairgrounds for a few decades until his permanent relocation to Red Mountain in 1936. 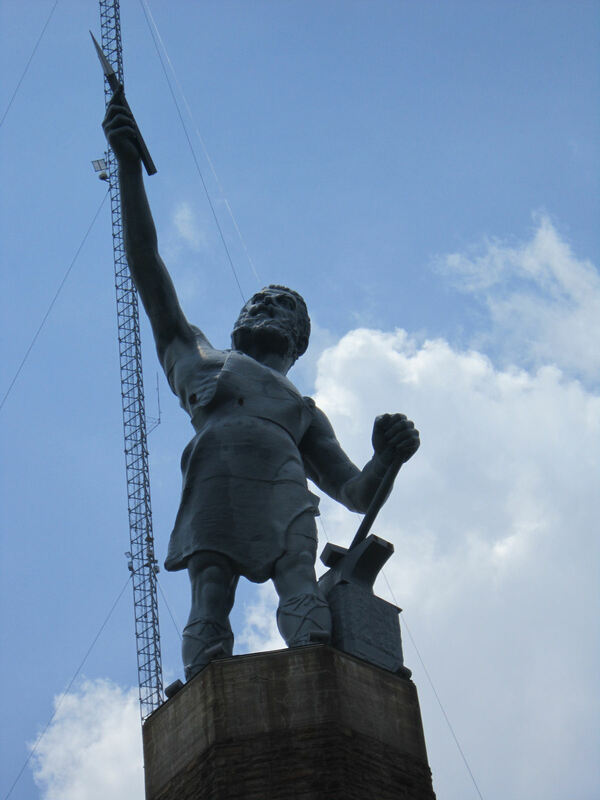 As designed by sculptor Giuseppe Moretti, Vulcan and his accessories weigh over sixty tons and stand fifty-six feet tall atop a twelve-story pedestal. 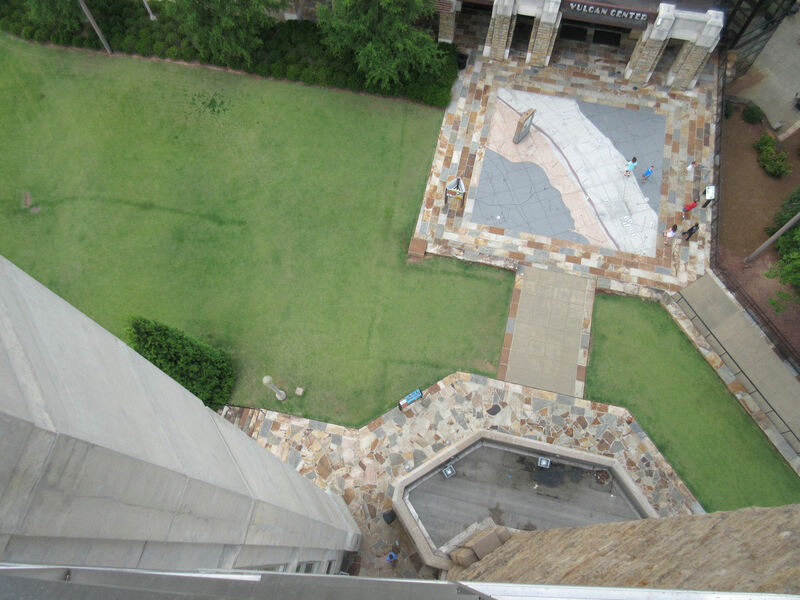 For comparison’s sake, the Statue of Liberty from torch to dress hem sans pedestal is fifteen stories. 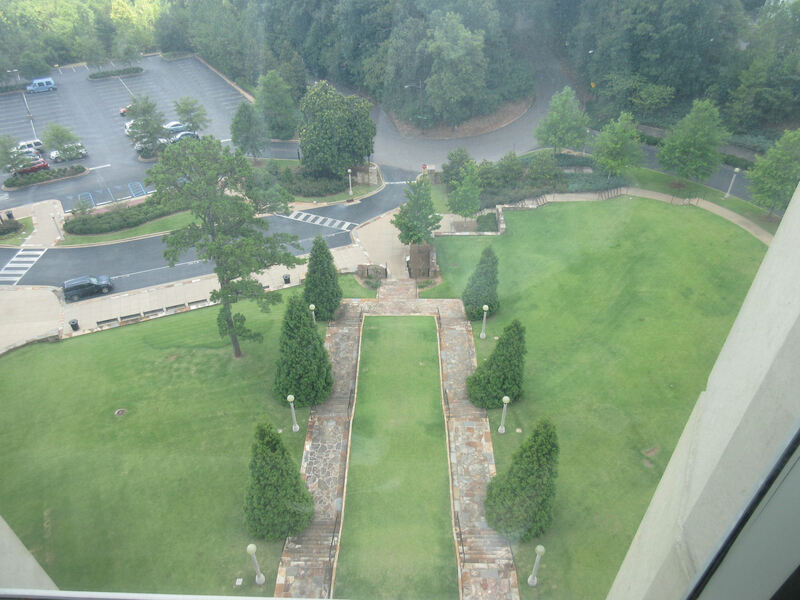 …and, if you zoom just right, variegated downtown Birmingham, where we spent the previous eight chapters walking and learning. 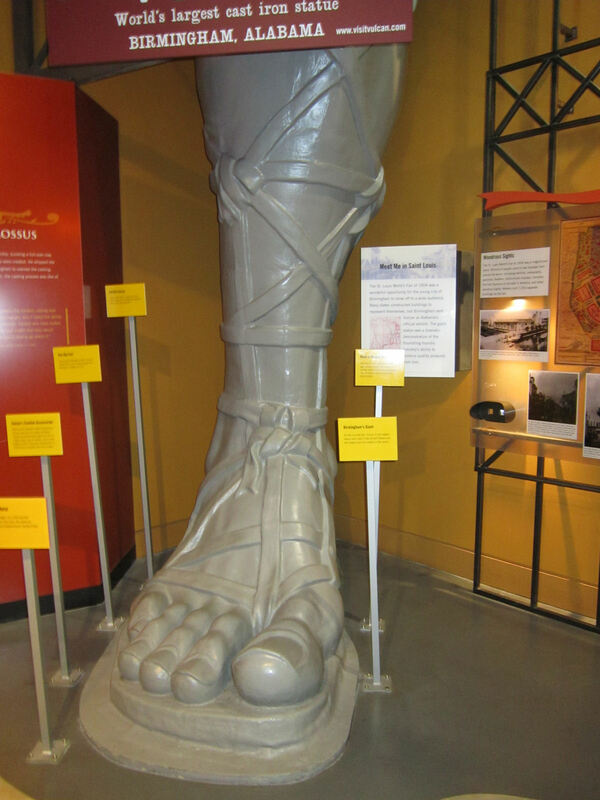 Part of the museum is naturally dedicated to Vulcan’s history, former pieces of it as well as this giant replica foot that gives you a more immediate idea of the immensity of his mighty toes alone. 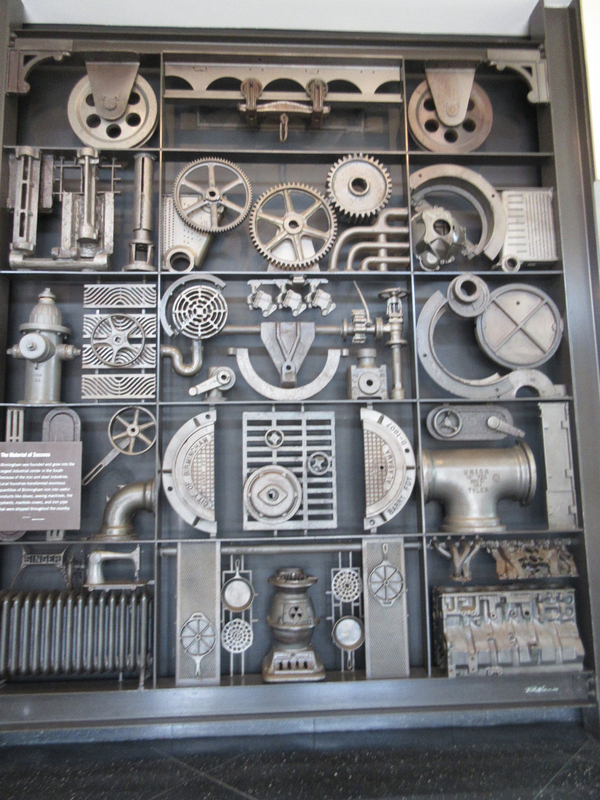 Much of the museum covers the history of Birmingham with an emphasis on local industries. Upon entering your first sight is a ceiling-to-floor sculpture grid called “The Material of Success”, sort of a workingman’s collage. 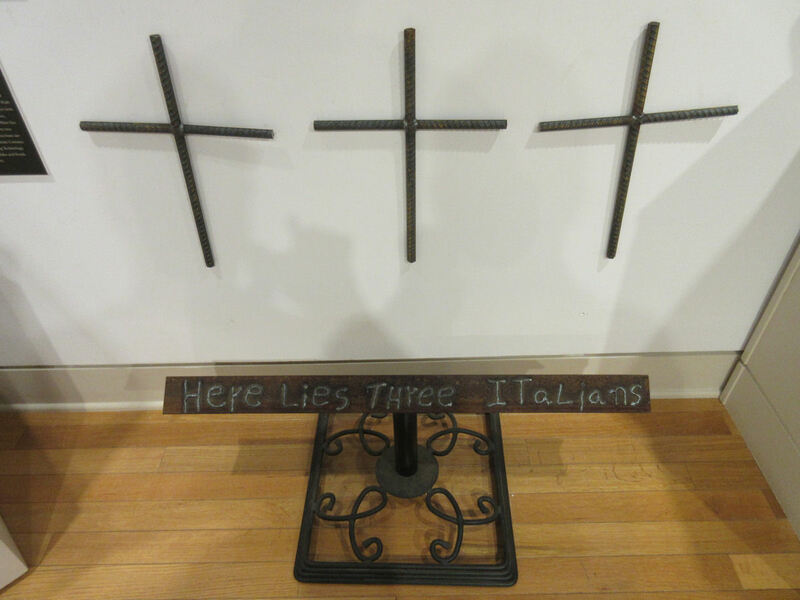 Several sections catalog the city’s notable history with confronting racism in too many forms and pay tribute to various communities that call Birmingham home. 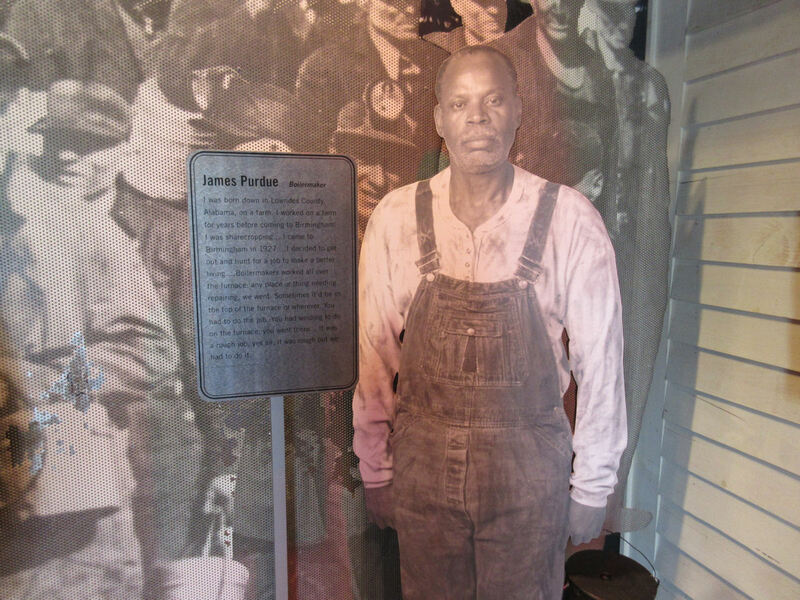 The commemoration of the blue-collar ethos exemplifies personalities such as average guy James Purdue, a boilermaker who, far as I can tell, has no overt historical connection to our own Purdue Boilermakers back in Indiana. Frankly, I have questions about this. 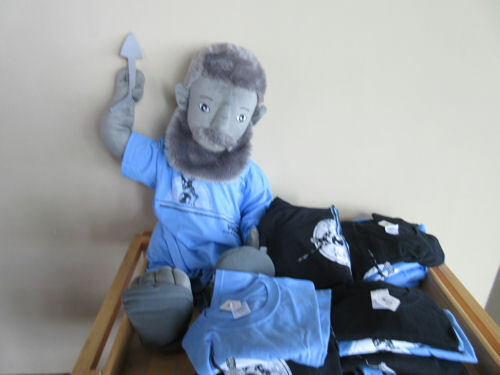 And yes, there is a gift shop where visitors can purchase all the Vulcan merchandise they’ll ever need. Pick up a Vulcan doll for the kids so the god of fire can watch over them while they sleep and vanquish the monster under the bed in thunderous combat. Or have cute Roman tea parties with him, whichever. Vulcan was our last stop before we left Birmingham, a city with more dimensions than we expected, a mixture of legacies and blights, of victories and tragedies, of progress and pride. Like any other American city it has a long “needs improvement” checklist to work through. 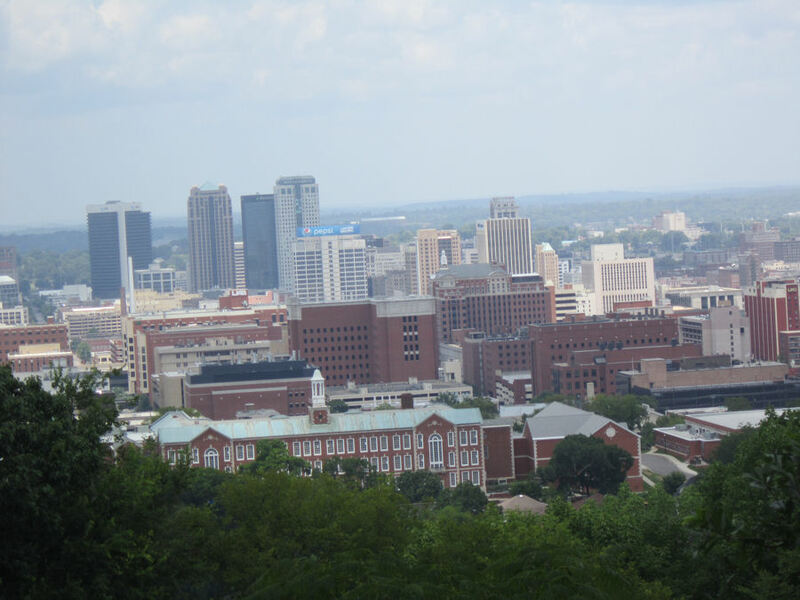 The long path that led us from the shade of Kelly Ingram Park to the shadow of Vulcan showed us numerous snapshots of where Birmingham used to be and what it hopefully keeps aspiring to become. I appreciate the kind words. For a number of reasons I can’t necessarily offer follow-for-follow to any and all just now, but I’ll be happy to revisit that in the future.